No other found ancient greek artifact has received more publicity that the Ancient Greek Doll of Owl Faced Athens (Athena Glaukopis) found in Boiotia and dated around the 6th century BC. This doll currently on display at the National Archaelogican museum of Athens, is considered the inspiration behind Phoevos and Athina, the mascots of the 2004 Olympic Games in Athens. It is considered one of best preserved ancient Greek dolls and representative of Daidala, the first documented human-like dolls or idols that also had joints (arthrotes plaggones, nevrospasta). 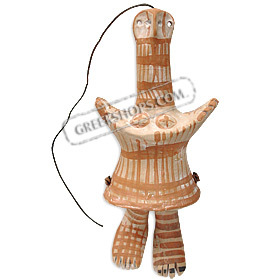 Daidala were known to have been produced in areas around ancient Athens and Corinth between 4th and 6th century BC. Its name originates from Daidali an idol used by Daidalos the Mythological Engineer to help Zeus and Hera reconcile, thus bringing Earth into existence. This is a true replica of the Athens of Glaukopis made from clay originating from the same fields where the original was found to ensure the same "look and feel" as the actual piece. All paint decorations were also made replicating methods used by potters of the particular period and using soil paint. This is why this item is hard to distinguish from the original and requires the attached traditional lead stamp that identifies it as a reproduction made by an authorized artist.